Dec. 9, 2016 | 1:45 p.m.
A colony of giant conifer aphids infest a juniper twig. For many Wisconsin residents, winter really kicks off with a series of holiday scenes: a roaring fire with a stack of split wood sitting nearby, the aromatic scent of a freshly cut Christmas tree, or perhaps, gingerbread cookies baking in the oven. With the exception of entomologists, it's a safe bet that few people around the state are thinking of insects during these times. And for good reason: Insect activity drops off considerably once outdoor temperatures dip below 50 degrees Fahrenheit. For the most part, winter is an "insect-free" period in Wisconsin and a reprieve from the state's "mosquito season." However, every once in awhile, winter traditions can lead to unexpected cases of insect activity. At the heart of these cases is the same phenomenon: an outdoor object brought inside and allowed to warm up. Luckily, none of the insects in these cases are reason for concern, and they are easily dealt with. Take the natural Christmas tree. Perhaps the most common insect encountered on Christmas trees indoors in the Midwest is a type of conifer aphid (Cinara species). Occasionally, these aphids have laid eggs on the branches and twigs of trees grown for the season. 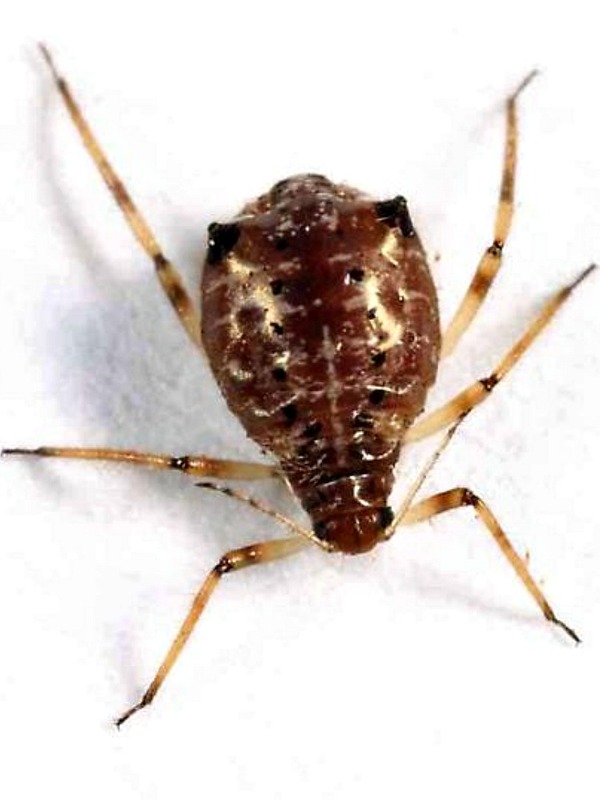 Within several weeks of a tree being brought indoors, the eggs hatch and aphids develop. They may even go completely unnoticed, unless a few of these one-eighth inch-long, purplish, tick-like insects fall from the tree and wander across the floor. Luckily, they are harmless to people and pets. At worst, they might leave a purplish stain if squished on a light-colored fabric. A giant conifer aphid collected from a black spruce tree. A few other creatures, including certain mites, spiders, plant bugs, and barklice, can be associated with real Christmas trees and can become active in the warm indoors. One of the easiest ways to prevent these harmless hitchhikers from sneaking indoors is to thoroughly shake a tree before bringing it inside a home. Shaking also helps remove loose needles from the tree, and, in fact, many cut-your-own Christmas tree farms have mechanical shakers available for this purpose. But if a Christmas tree happens to host an insect surprise, there's no need to panic or use insecticides — the hose attachment on a vacuum cleaner is sufficient to deal with them. Based on reports at the University of Wisconsin Insect Diagnostic Lab, any insect activity on Christmas trees often isn't noted until well after the holiday, which may simply be a cue to remove the decorations and haul the tree outside. In the end, encountering insects on a real Christmas tree isn’t common and the traditions of using a live tree far outweigh the small chance of an insect encounter. A more common way to encounter insects during the winter months is in firewood. A wide variety of insects live in dead or dying trees, which are often the first to be cut and earmarked for the fireplace. Hundreds of species of longhorned beetles, metallic wood boring beetles, wood-wasps, bark beetles and other creatures can be associated with firewood. Out in the woods, these insects would merely wait out the winter to resume activity in the spring. However, if firewood is brought indoors and allowed to sit for an extended period of time, insects in the wood have a chance to complete their development and emerge. 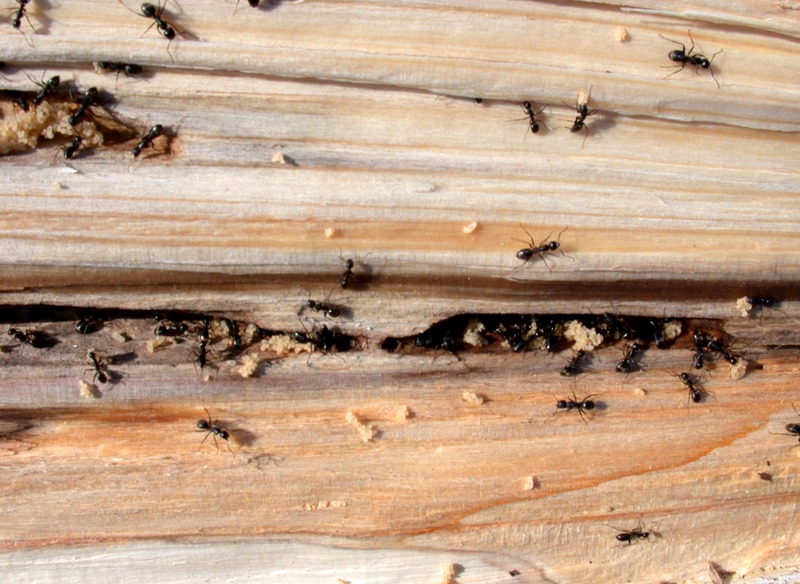 Some species of ants can be found in firewood. As with insects on Christmas trees, the creatures emerging from firewood are harmless to people and pets, and they don't pose a threat to the physical home. Biologically speaking, emerging indoors in the heart of winter is a "dead end," as the insects emerge into conditions inhospitable for their survival. At most, these insects could be a nuisance as they confusedly hang out near a window, thinking spring has arrived early. Preventing insects from emerging from firewood indoors is an easy task. The best precaution is simply to leave wood in a cool location outdoors or in an unheated garage until it's ready to be used in a fireplace. Bringing in a bundle of firewood and using it within a few days isn't an issue. However, firewood that sits indoors for weeks without being used can be a source of insect activity. If insects are suddenly found indoors during the winter months, that stack of firewood may be to blame. In such situations, insecticides are not needed. Instead, removing the firewood and placing it in a cold location should prevent additional insect appearances. Using a vacuum cleaner hose attachment can take care of any active insects wandering lost around a home. University of Wisconsin-Extension entomologist PJ Liesch is director of the UW Insect Diagnostic Lab, and he blogs about Wisconsin insects and can be found @WiBugGuy on Twitter.